Barry Smitherman, Texas Attorney General Candidate, and current chairman of the railroad Commission, is one of the STRONGEST opponents of Abortion I have ever met. 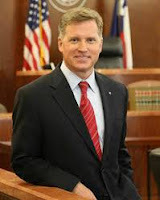 He is strongly pro-life and would vigorously defend the rights of the unborn to live and the pro-life laws in Texas. Smitherman is so pro life that he just just enthusiastically endorsed by Texas Right to Life. AUSTIN – Today the Texas Right to Life Political Action Committee informed Barry Smitherman that it was endorsing his candidacy for Attorney General. Texas Right to Life is the oldest, largest, and only statewide Pro-Life organization in Texas. They are the Texas affiliate of the National Right to Life Committee with representation on their board of directors. Barry Smitherman is an unwavering supporter of life and takes every opportunity to passionately speak in support of life. On March 2, 2013, Barry spoke to the Texas State Republican Executive Committee about why it’s so important for our federal and state governments to protect life. Texas Right to Life endorsement may be viewed at www.TexasRightToLife.com. More information about the Smitherman Campaign is available at www.BarryForTexas.com. What we need is an Attorney General who will stand strong on nullification against ALL of the unconstitutional federal "laws" that threaten Texas.